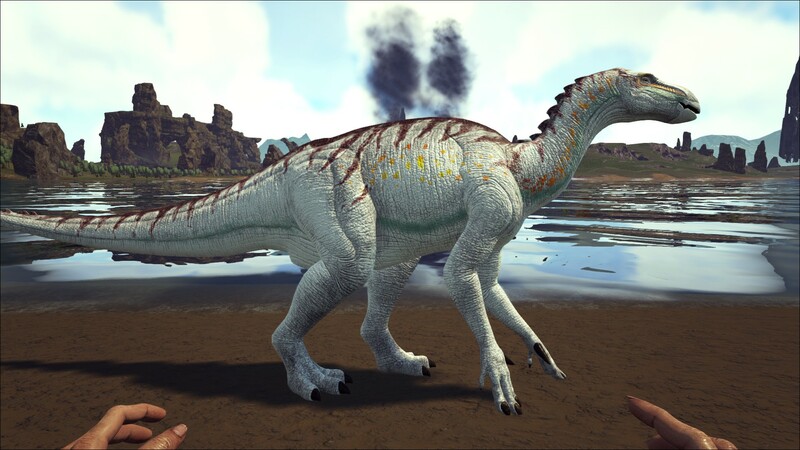 The Iguanodon (ig-WAN-oh-don) is one of the Creatures in ARK: Survival Evolved. Of the many creatures I've yet encountered on the Island, the Iguanodon vicissitudinis has the distinctly versatile capability of switching its primary method of locomotion according to its momentary needs. Primarily a rather lethargic bipedal herbivore native to the Island's many grasslands and forests, in situations where increased speed or maneuverability is called for, it will quickly shift its posture into quadrupedal stance and behave like a very different creature! While bipedal, it can employ rapid, stabbing attacks with its distinctive thumb spikes. In quadrupedal stance, conversely, it seems to have an endless supply of stamina, even while sprinting! Interestingly, the Iguanodon's thumb spikes also provide it with the capability to pick seeds out of fruits, allowing a farmer to easily convert stacks of fruits into stacks of seed for planting. Combined with its highly effective fruit harvesting and substantial carry weight, the Iguanodon's excellent mobility in bipedal stance makes it an ideal field-hand that can also pull off a quick get-away or an agile defense when needed. Iguanodons, like many other herbivores on the ARK, are gentle creatures that will not harm humans or other animals on sight. However once attacked, they will fight back using their thumb spikes in bipedal mode. When sufficiently injured or if their torpor rises high enough, they will turn and flee on all four legs. Like other herbivores, it is a herding animal and will help defend others from attack. The Iguanodon is a medium herbivorous dinosaur that bears a strong resemblance to the Parasaurolophus but without the distinct head crest. Instead the animal has two spike-like thumbs for prying fruits open to reach at delicious seeds and stabbing would-be predators. They are as capable of walking on all fours as they are on just their hind legs. This section displays the Iguanodon's natural colors and regions. For demonstration, the regions below are colored red over an albino Iguanodon. The colored squares shown underneath each region's description are the colors that the Iguanodon will randomly spawn with to provide an overall range of its natural color scheme. Hover your cursor over a color to display its name and ID. For example, "cheat SetTargetDinoColor 0 6" would color the Iguanodon's "body" magenta. The Iguanodon has a rather fast movement speed for early players and will begin to run when Health or Torpor gets low, making the Bola a valuable tool when attempting to knock one out. This section describes how to fight against the Iguanodon. Despite being an otherwise passive creature, the iguanodon will retaliate against any violence directed toward it. It is surprisingly competent in combat. A sword will be more than sufficient, due to its rather low Base Health. Avoid attacking from the front by using bolas or disatracting it with a mount due to its decent reach when using melee. Its attacks can easily kill a unprepared survivor. Susceptible to Bolas and has rather low health pool. Low Level Mount: Moderately easy to tame (just remember to bring a bola or a bear trap!). Toxin Farmer: Gathers mass quantities of Bio Toxin from Spore-Inducing Mushrooms (level up melee damage) in Aberration. Farming Aid: Allows for berries to be turned into seeds, making once hard to get berries much easier, e.g., Narcoberries. Also great for making organic oil from bulk seeding of berries if you play on primitive plus. 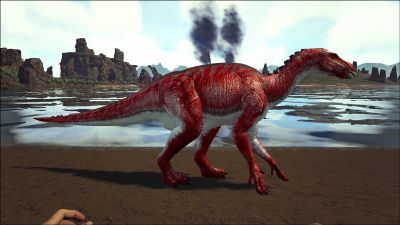 Charge Light Feeder: In Aberration, the Iguanodon can take on a unique role of providing mass quantities of food for your charge light tames, as they prefer a steady diet of seeds compared to other food types. Simply gather berries, have the iguanodon seed them, then place the seeds in food troughs, and your charge light tames will be well fed for quite some time. Dino Dossier released on October 12, 2015 on Steam. The dossier mistakenly lists Iguanodon as living during the Late Jurassic, when it instead lived during the Early Cretaceous. rmb, , allows to switch between bipedal and quadrupedal. Has increased speed and unlimited Stamina while running quadrupedal. Its full name means "alternating iguana-tooth", referring to its ability to switch between bipedalism and quadrupedalism. ↑ Introducing the Iguanodon & 'The Last Stand' Tournament Update!